The hostel is set in a traditional Portuguese house redesigned with AC and Non AC dorm and private rooms to fit the budget of every traveller. 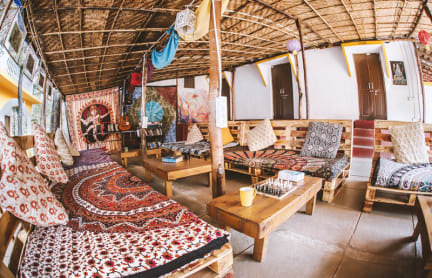 The hostel includes a rustic common area, garden with hammocks, fully equipped kitchen, free filtered water, secure lockers and 24 hour security. Our friendly staff are always available to provide guidance on renting scooters, taxis, public transport and on things to do in the area like the Flea Markets, restaurants, party places and beautiful beaches. - Cash payment is preferred at check-in. Credit card payment occurs a 3% bank surcharge. - Free cancellation or change of booking is available up to 3 days before the scheduled check-in date. Deposit is non-refundable if cancellation is less than 3 days before check-in. - ALL guests, including Indian citizens, are required to provide original Passports at check-in. We cannot accommodate travellers without passports and will be forced to cancel such bookings. - We do not accept group bookings of more than 4 people at this property. (please do not make separate bookings). - For bookings between Dec 15 to 9th January, full advanced payment is required before arrival, once the booking is confirmed. Damn i never wanted to leave. Everyone staying here was just sooo friendly and chill. Never seen anything like it. The hostel decorations are beautiful. Cool art/vibes everywhere. Good music playing. The hosts are very helpful. One of them (Ravi) is a psy dj and knows how to direct you to find any sort of party you want (from DnB to techno to psytrance). There is clean filtered water at the hostel (which is amazing). All in all this spot is dialed, what a treat it was to stay here. Ill b back! Such an amazing place!! Stayed at the beginning of my trip and ended coming back for another couple days. Fantastic location, such a vibe and great staff. Ravi is so helpful, along with the others. 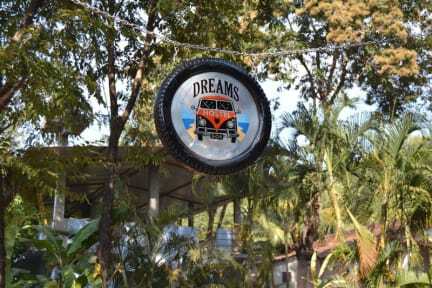 I highly recommend this place if you want the best experience of Goa!! I’m screwed now that I’ve stayed at Dreams because I can’t seem to find a place that comes even close to how amazing this hostel is. The staff are incredibly helpful and friendly. Rooms are clean and comfortable. Atmosphere is amazing and has the best vibes. Good music and awesome people. Great location with everything you could possibly need in Goa nearby!! Stay here you won’t regret it!! Our favourite hostel in India. Stayed here before and after Hampi, extending both times. Ravi and everyone that works there are so lovely. Feels like a home as proper kitchen, ping pong table and plants. Common area creates a really good atmosphere. You are able to party or chill to the levels you want to. Ensuite not needed as shared bathroom is good. I really can’t say enough about how wonderful my stay at Dreams Hostel was. The atmosphere is fantastic and the guests and staff were definitely what made my stay so memorable. Comfy beds, clean bathrooms, and the freedom to party, read, drink, or chill- there’s no judgement at dreams! The *only* downside was that the security lockers in rooms were small and there was no luggage storage after checkout. Just bring a bag lock & some earplugs if you’re an early sleeper! Thanks for a great stay! Really atmospheric hostel located very close to the beach! The hostel has a great social area and a useful kitchen that also has cooked breakfast on offer for a reasonable price! Would recommend to anyone visiting Anjuna area! Staff was very accommodating & friendly, but the facilities were basic and atmosphere of the place left little to be desired. I’d really only recommend coming here if you’re into the Goan “Trance” party scene. Otherwise you’re going to be bored. I didn't get to stay here as when I arrived at the hostel I was told I was too old. I missed the fine print stating the cutoff age. I'd recommend that Dreams Hostel makes the age restriction more obvious.